Speaking to the Republican Jewish Coalition on Saturday, U.S. Sen. Ted Cruz made an extensive argument that he is the most viable Republican presidential candidate. U.S. Sen. Ted Cruz on Saturday made his most extensive case yet that he is the most viable 2016 presidential candidate, seeking to rally Jewish donors to his side as he stares down a nomination battle with frontrunner Donald Trump. Speaking at the spring meeting of the Republican Jewish Coalition in Las Vegas, Cruz walked his audience, in sometimes granular detail, through his plan to win the Republican nomination, unite a divided GOP and prevail in a general election. The pitch was unmistakably geared toward a friendly but not unanimously pro-Cruz audience of donors intensely interested in getting behind a candidate who can win. "Can Cruz win?" the candidate himself asked at one point, offering an advance apology a short time later. "I’m going to get a little wonky here and in the weeds." After his decisive victory Tuesday in Wisconsin, Cruz said Trump’s chances of winning a majority total of 1,237 delegates before the convention are “almost impossible.” If the race goes to a contested convention, Cruz predicted that the first ballot would be the “highest vote total” Trump will receive and that the senator would prevail on a subsequent ballot. Despite Cruz's confidence, he amplified his warnings about the damage Trump could do the GOP if he wins the nomination and heads into a general election where Democratic frontrunner Hillary Clinton would be favored to win. To that end, Cruz offered his most explicit prediction yet about what a Trump nomination could mean for down-ballot races in November. During a question-and-answer section after his remarks, Cruz also sought to make the case that he is the best candidate to bring the party together after what has been a “bloody battle” of a primary season. He cited his strength among blue-collar voters, seen as a key part of Trump’s coalition, calling himself the “one candidate who has been consistently competing well and effectively” with Trump for their support. “We have got to achieve that unity," Cruz said, "and we’ve got just over 100 days to do it." Looking forward to the general election, Cruz expressed confidence he could put in play a number of states that have gone against Republicans in recent presidential elections. “Pennsylvania is a state I believe we can win again as Republicans,” Cruz said. The crowd warmly received Cruz’s appeals on electability, though he acknowledged at multiple points that not everybody in the room might be his biggest fans. He addressed Republican Jewish Coalition members who had backed other candidates — a “perfectly natural reasonable thing” given how big and diverse the GOP field was when the race began — telling them now is the time to unite. And he acknowledged that his positions on immigration and social issues could rub some the wrong way but called for respect and civility in hashing out such differences. “Nobody wants to elect a hectoring scold,” Cruz said. Cruz’s talk of electability dominated his appearance at the meeting, but it was not short on appeals to the Republican Jewish community. He blasted President Obama’s nuclear deal with Iran and promised to move the U.S. embassy in Israel to Jerusalem, occasionally dinging Trump for his limited knowledge on such issues. “I’m told Donald even read that promise off teleprompters at AIPAC,” Cruz said of the embassy promise, referring to Trump’s unusually scripted appearance before the pro-Israel group last month in Washington D.C.
Cruz was the only one of the three remaining Republican candidates to accept an invitation to speak at the meeting, which was held at the Venetian hotel and casino. The Venetian is owned by Sheldon Adelson, a top Republican Jewish Coalition supporter and Republican megadonor who has yet to make his preference entirely known in the GOP race. Adelson has expressed some openness to a Trump presidency but has also given to Cruz’s campaign, cutting a check for $2,700 — the maximum amount — in November. Cruz’s campaign kicked off the weekend by announcing it had raised more than $12.5 million in March, its biggest monthly haul yet. 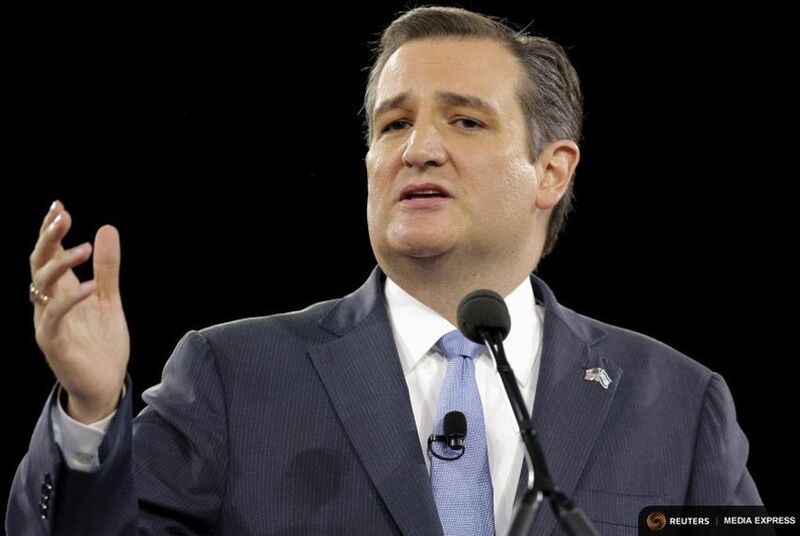 The number brings Cruz’s fundraising for the first quarter of 2015 to roughly $32 million. The campaign has until Friday to disclose its first-quarter finances to the Federal Election Commission. The coalition summit was also playing host to two governors who support Cruz, Greg Abbott of Texas and Scott Walker of Wisconsin. Both were set to speak Saturday as part of a program with Massachusetts Gov. Charlie Baker. Unlike Cruz’s speech, the program was not open to reporters.